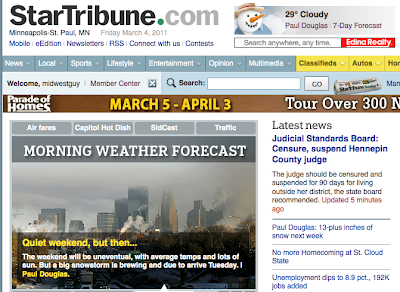 The morning online edition of the Star Tribune highlighted snow prospects for next week. FOX: "If we don't take a direct hit, we'll be close." HAHA...PD's getting alot of traffic on his blog...people reading the 53" total model print out of total accumulating snow by Windom are freaking out!!!! Bill you'te gonna get some new followers out of this too! I expected weather mania will be in gallop mode by Saturday with this. I am personally going on a news/weather black out starting tonight and going with Netflix weekend instead. It will keep me from becoming jacked up about the crazy weather people trying to tie this one down. All you not included though!!! 12z euro way south @96 in OK, south trend continues.....could this bust? It is interesting, maybe why I am interested in weather, but this morning the models were in sync with each (so I read on here), putting heavy snow over MSP, now 4 hours later boom the downward spiral has begun and the shift is on, soon 3-6 for totals. I have heard several times that PD is too knee jerk, not making a decsision on one run. Is the warranted or is it a slight hiccup. If I remember early on there was a run that put one model having the storm track throught MN. It all changes so fast! The 12z GFS shows solid upper level Jet Dynamics on Tuesday with a nice coupled jet structure over the Plains states. However, by Wed., this coupled structure is gone and much of the Midwest is dominated by strong upper level winds from the SW. This could quickly end our precip. via a dry slot. Meanwhile, the mid/upper level low is left spinning south of MN in the Plains. Still a long ways out, but a potential red flag. As a meteorologist, I'm disappointed how heavily the "professionals" hangs on the end model output (MSLP+QPF) and the run-to-run variations. Are you a meteorologist or just a map interpreter? In the end, we're talking about a system thats still up near Alaska that has to come down the west coast, cross the mountains, redevelop and then get ejected by an upper jet and where a 150 mile shift is the difference between two inches and 20 inches. P, interesting thoughts. As a meteorologist, when would you feel reasonably comfortable mentioning accumulation amounts? Do you feel that the television mets are forced (by media pressure) to "cough up" accumulation estimates before they really should? CWY, thanks for the refreshing big-picture perspective! Sven certainly seemed underwhelmed by this thing during the 5:00 news. notice my post at 12:57....the 18z gfs run is in and shows a bust....hiccup or the real deal??? However, the flip-flopping of models and differing solutions from each only underlines the fact that a responsible forecaster should Not attempt to get too specific this far out. It just seems foolish to attach snow totals 5, 6 7, 10 days in advance. Hell, some forecasters are throwing out totals for a storm that is suppose to hit 2 weeks from now! This only adds fuel to the fire since the public often latches on to these snow totals rather than examining the whole body of work from said forecaster. I don't believe there is much doubt that a large storm will eventually kick out of the Rockies next week, but where? Simply too early to commit. "One a side note, there are 3 other medium range models that create a near miss or a miss altogether with this system. However I don't give them much credence at all because they have performed very poorly this year at best, when this far out." I threw this out because all forecasters should look at all available data and just not focus on the GFS or ECMWF (European) Granted I discounted these models as well because of their poor performance this winter, however the models have a real hard time in the transition periods (ie winter to spring etc)so it would behoove our local mets to take these into consideration. These three models are the Canadian (GEM, or CMC) the US Navy model (NOGAP), and the Japanese Model (JMA). If the southern solution does indeed confirm this will be the first time all winter that these models, in my opinion have owned the GFS and European. PD on his blog...even after downgrading next weeks event, stated that we havent seen the last of 12" snowfalls .... he is being ripped big time on his blog...maybe time to scrap the 7 day outlooks? You have to remember that the upper level energy can't be sampled until 36 to 60 hours before the storm when it makes "landfall" on the west coast. Thats when the models figure it out because the upper air balloons from the west coast are actually sampling the storm. After a quick look at 12z ECMWF and the latest 00z GFS. I'm now much more confident that this will be a snow event for much of southern MN including MSP. However, it will likely NOT be the monster headline event that was predicted by many over the last few days...at least not in MSP. I could see several inches of snow in the metro by late Wed., but the jackpot will likely occur in se MN, NE, Iowa and WI. Novak....how far north will get snow? As an amateur weather buff, the one thing I can almost count on, is that if the models have a bulls-eye lining up 7 days out for a region, it is almost a certainty that the storm will change course. It is almost like a jinx that far out. Knowing that, I go into a predicted storm like this with guarded optimism. I know that models have been pretty good this winter. But even the 2 big storms were not predicted that well 5 days out, let alone 7 days out. Throw in the fact that Thursday's (3/3) light snow was not handled well in MSP just 1 day in advance. What about this Sunday (3/6)? Would anyone be surprised if we (MSP) end up with more snow from Sunday than we do Tue/Wed (3/9)? Anyway, love all the comments and I check here often since I have much to learn. I think three days out is good for specific snowfall amounts and five days for liquid QPF. In my experience the more "heads-up" for QPF is reasonable as snowfall is much more complicated than QPF*10! I think overall forecasts are good at these ranges. However (! ), I will say that providing info of a significant rain/snow event in the 7-10 day range is very reasonable, as long as the provider and consumer agree and understand that there is less confidence in that forecast and specific amounts are not justifiably available (though sometimes very broad ranges are). I personally have seen weather models provide exceedingly good forecasts of big storms at even 12 days out, so I refuse to lump every storm and every day into a junk bin. The role of the met is to actually interpret the data, understand what is going on, and convey that message to the consumer (not simply regurgitate what the model output is). It is the consumers job to understand probability and inherent difficulty in forecasting. I would strongly argue that a third component is sorely missing in our current forecasts - confidence. A simple 1-10 confidence scale of the overall forecast would go a long way I believe (and may get to the crux of your most recent post of being a betting man).